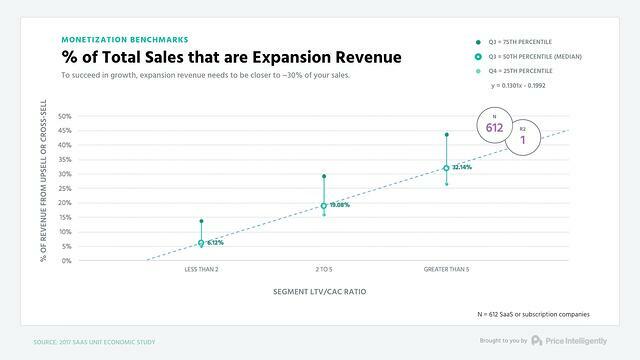 30%+ of your revenue should be expansion revenue. You're likely only at 10%. That title seems self-evident. Yet, from the way most SaaS companies act, you would think it was insanity, because the SaaS world sees just one road to growth: net new acquisition. To be successful though, this mindset needs to change. 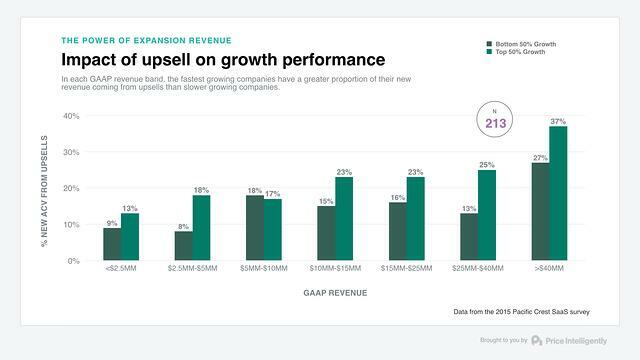 In a study of a few thousand SaaS and subscription executives and founders, 7 out of 10 of them said if they had to focus on one piece of their business, it'd continue to be net-new growth. 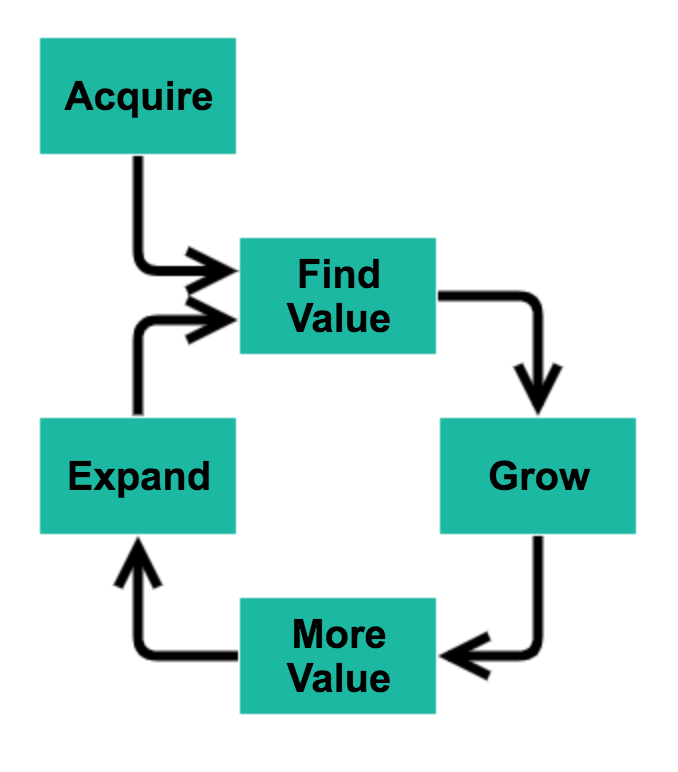 As a field, we are obsessed with acquisition, because we naturally think more customers = more revenue. This line of thinking ironically won't make you grow. True growth in SaaS doesn't come from new customers, it comes from existing customers. As they grow, you grow. As you grow, they grow. Let's walk through why your existing customers are so crucial to growth, before outlining a framework you can use to build out your expansion revenue strategy. As companies improve, more of their revenue comes through the expansion of current customers. The naive view of this will be that the observation is obvious: companies that are larger have more customers to expand. Correlation does not equal causation. 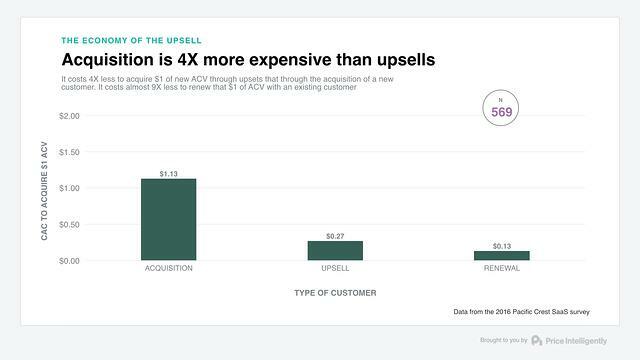 Companies that are growing faster get more of their new annual contract value (ACV) from upsells. Slower growth comes from acquiring entirely new customers. Acquiring a completely new customer is over four times more expensive that upselling an existing customer. For every $1 of revenue you get from a new customer, it costs $1.13 to acquire. That means it takes over a year for you to recoup your customer acquisition costs for a new customer. It's only halfway through the first quarter of their second year that you see profit from these customers. 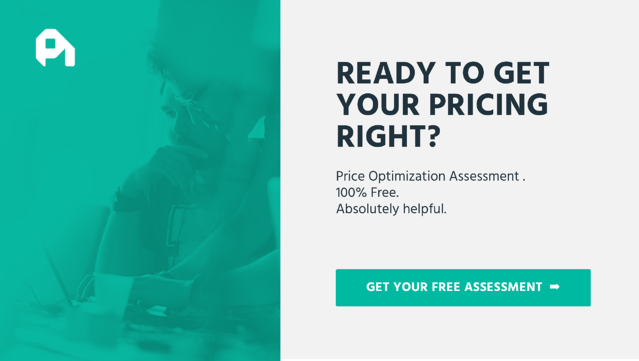 Upsell customers cost just $0.27 for every $1 yearly revenue they bring. So you get back their costs after a single quarter. This difference of ~1 year in payback period can make a huge difference when you take into consideration the compounding nature of subscription SaaS. For a company growing through new acquisitions only every month, the payback period for ten new $100 customers each month is over 2 years. At its lowest point, this company is losing $7k per month through customer acquisition. The cumulative sum of all negative revenue is $123,000. But this isn't the problematic part. It's that all this time spent in the red hampers growth. With such high customer acquistion costs (CAC), instead of compounding positive revenues, the compounding negative revenues mean that this company would be way behind in growth. After 36 months, this company is in the black, but only at $15k MRR. Contrast that with a company growing only through expansion revenue. 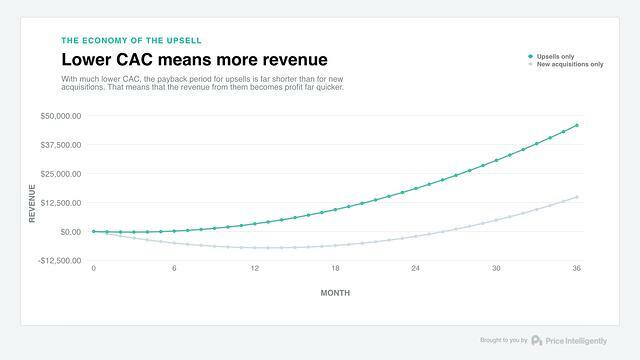 With all the same numbers, but a much lower CAC, the payback trough is hardly visible—they are profitable at the 6-month mark. After 36 months, their monthly recurring revenue (MRR) is 3X the acquisition—at $45,000. OK, so you aren't going to build a company entirely through expansion. For a start, you need to acquire to expand. But these ideal examples show the truth. The more your business model is skewed towards expansion, the more money you are going to make. You make money from your existing customers. 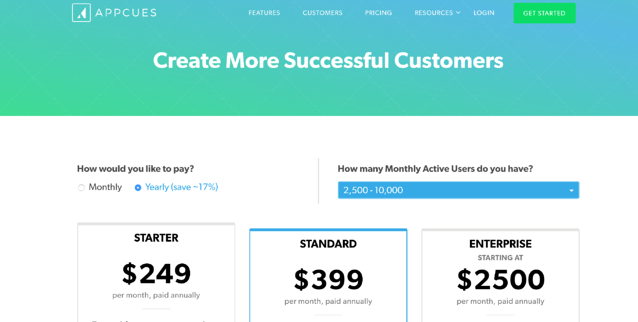 Here a company is adding $100 per month to its revenue. But each new cohort suffers from 5% churn. Looking at the first cohort at the bottom gives us the best idea of what happens over the space of a year. In the first month this cohort brings in $100 MRR. Great. 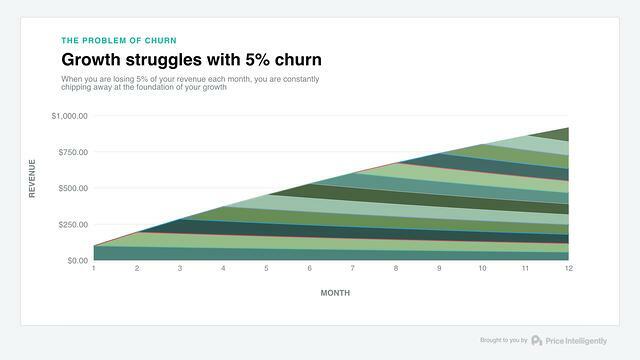 But then 5% churn. So in month 2 the same cohort is only contributing $95 to MRR. “That's OK,” you might say, as we acquired the next cohort that contributes $100. So we are at $195 MRR by the end of month 2. Nice! But then 5% of them drop out. At the same time, another 5% of the first cohort have churned. In month 3, cohort 1 is only contributing ~$90 to MRR, and cohort 2 $95. “That's OK,” you might say, as we acquired the next cohort that contributes $100. And so on. All the time you are acquiring customers, you are also losing the foundation for growth. After a year of this acquisition, MRR should be $1,200. But it is only ~$900. One-quarter of your revenue has disappeared. Even that isn't the biggest problem. If you look at the graph, it is trending towards asymptote—growth is plateauing. Eventually with this level of churn, growth will stop. This graph shows 5% negative churn. This slightly odd misnomer means that instead of losing 5% of revenue each month, you gain it through expanding customers. In this scenario, each cohort grows with time, offering a better foundation to the next cohort. $1,200 has turned to $1,600, and growth is growing. Again, these models show the ideal. But they show what is possible. 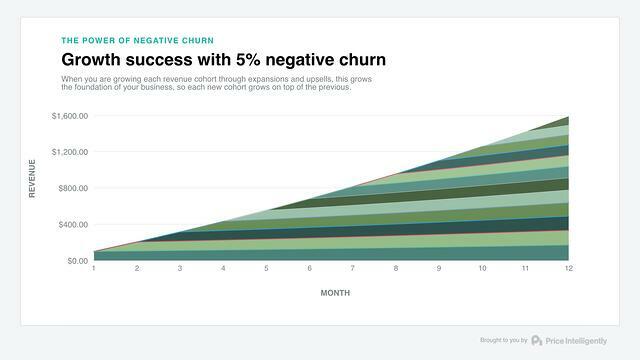 If you can get negative churn through expansions to outpace regular churn, you'll grow. The way to do that is to offer your customers not only what they want, but also what they need. Both of these come from the growth lever that only 10% of the SaaS world are talking about: monetization. From this, you can immediately see the growth potential for both your customer and you. For instance, if Appcues does well in helping users onboard for its customer, that customer will grow. Because that customer is having success with Appcues, they want to stay with them. So they will want to expand their Appcues service. Appcues captures the value the customer finds in their service, and is able to grow right alongside its customers. Customers are happy to pay extra because it is a fraction of the revenue they are creating from their own growth, which is in part due to Appcues. This is why expansion revenue works so well, and why the bigger you get, the more it becomes important. Acquisition naturally dries up, but if you continue to give great value to your existing customers and they continue to grow, then you can take part in the growth of every single one.